Gallery not ready One of the more storied and long-lived locomotives, the New York Central's famous S2 class has a fascinating history. Built in 1906, the last wasn't retired until 1981! Now, Lionel brings this powerhouse back, and for the first time, with some new features and paint schemes representative of their entire storied careers. NYC&HR #3207 shows the look of the S2 class c. 1909 - 1917. This was one of two locomotives involved in a tragic wreck which led to the changes in the S2 design. #113 represents their look from 1936 through the 1940s. By the 1960s, safety yellow began to be applied to handrails and steps as seen on #115. 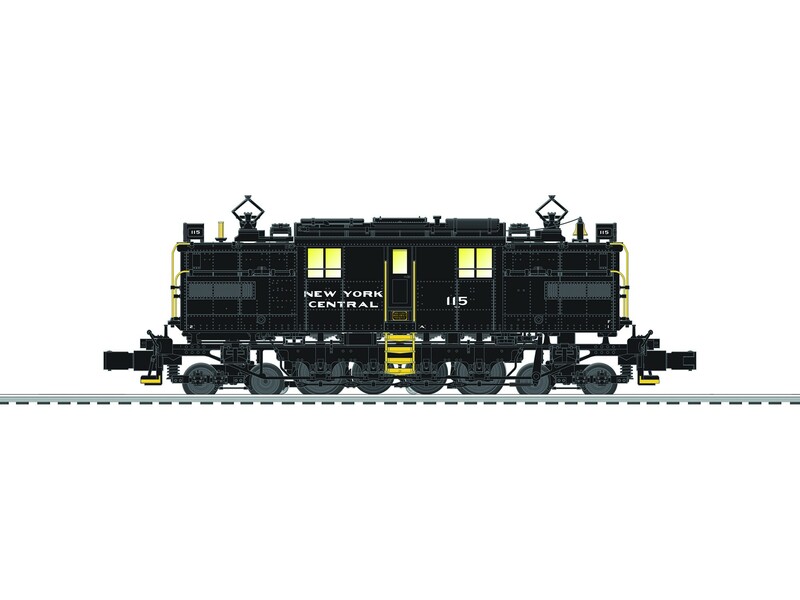 Many of the locomotives kept a similar look into the Penn Central years and some even survived to serve Conrail. Although none ever wore the more elaborate schemes applied to some of the Central's other electrics, our version of #101 represents a fun "what if" portrayal of what these motors could have looked like in the classy "Lightning Stripe" era. The S motors have been a Lionel inspiration for over 100 years. Now, you can have this locomotive for the first time with the latest LEGACY® electronics and a swinging bell feature which moves the bell in time with the sounds! LEGACY® RailSounds® sound system featuring: CrewTalk™ dialog and TowerCom™ announcements, each with different scenarios depending on whether the locomotive is in motion or stopped Six official railroad speeds with CrewTalk dialog Eight diesel RPM Levels LEGACY® "Real-Time Quilling Horn" control with instant response for realistic signature "quilling" and correctly timed warning signals Single hit or continuous bell sounds Sequence Control: plays the sound effects of an entire trip, including warning sounds and announcements, based on the movement and speed of the locomotive Current speed and fuel dialog, coal-loading sound effects IR Transmitter works with LCS SensorTrack™ Powerful maintenance-free motor with momentum flywheel ElectroCoupler™ on front and rear of tender (A-A set has ElectroCouplers on front only) Traction tires Refined Conventional Transformer Control Mode with lower starting speeds Fan-driven smoke unit, excludes S2 Electrics Adjustable smoke output Directional lighting including LED headlights Marker lights on front and rear Illuminated number boards Lighted cab interior Die-cast metal trucks, pilot, and fuel tank Metal frame High levels of separately applied metal details Engineer and conductor figures Additional Features: Die-cast body and frame Sprung pantographs Swinging Bell - bell swings back and forth in sync with sounds Single powerful maintenance-free motor PRODUCT SPECIFICATIONS Rail Line: New York Central Road Number: 115 Gauge: O Gauge Scale Type: Scale Brand: Lionel Trains Power: Electric Engine Type: Diesel Min Curve: O36 Dimensions: Length: 11 3/4" "